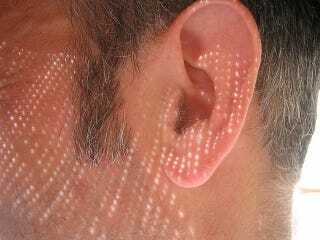 Frank Swain, who has been going deaf since he was in his twenties, had his hearing aids tweaked so that he could hear Wi-Fi fields wherever he goes. Swain wrote about the experience for New Scientist, describing what has become a regular part of his day. Recreating hearing is an incredibly difficult task. Unlike glasses, which simply bring the world into focus, digital hearing aids strive to recreate the soundscape, amplifying useful sound and suppressing noise. As this changes by the second, sorting one from the other requires a lot of programming. In essence, I am listening to a computer's interpretation of the soundscape, heavily tailored to what it thinks I need to hear. I am intrigued to see how far this editorialisation of my hearing can be pushed. If I have to spend my life listening to an interpretative version of the world, what elements could I add? The data that surrounds me seems a good place to start. I have been able to hear these fields since last week. This wasn't the result of a sudden mutation or years of transcendental meditation, but an upgrade to my hearing aids. With a grant from Nesta, the UK innovation charity, sound artist Daniel Jones and I built Phantom Terrains, an experimental tool for making Wi-Fi fields audible. Our modern world is suffused with data. Since radio towers began climbing over towns and cities in the early 20th century, the air has grown thick with wireless communication, the platform on which radio, television, cellphones, satellite broadcasts, Wi-Fi, GPS, remote controls and hundreds of other technologies rely. And yet, despite wireless communication becoming a ubiquitous presence in modern life, the underlying infrastructure has remained largely invisible. Every day, we use it to read the news, chat to friends, navigate through cities, post photos to our social networks and call for help. These systems make up a huge and integral part of our lives, but the signals that support them remain intangible. If you have ever wandered in circles to find a signal for your cellphone, you will know what I mean. Phantom Terrains opens the door to this world to a small degree by tuning into these fields. Running on a hacked iPhone, the software exploits the inbuilt Wi-Fi sensor to pick up details about nearby fields: router name, signal strength, encryption and distance. This wasn't easy. Reams of cryptic variables and numerical values had to be decoded by changing the settings of our test router and observing the effects. Read the whole thing, including how Swain sees this as the aural version of Google Glass, at New Scientist.